Aortic valve stenosis is a type of congenital heart defect. Congenital heart defects are heart problems a baby is born with. These heart problems are usually diagnosed at or before birth. "Aortic" refers to the aorta, one of the two main arteries attached to the heart. The aorta sends oxygen-rich blood (red blood) out to the body. 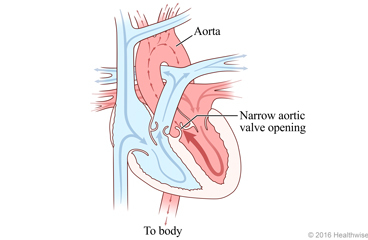 The aortic valve is the gate through which the heart pumps blood into the aorta. "Stenosis" means "narrowed." In aortic valve stenosis, that gate is too narrow. The heart has to work harder to push blood through it. So the baby's body gets some oxygen but not enough. And over time, this can weaken the heart. A baby with aortic valve stenosis may also have other heart defects. Symptoms depend on how much narrowing there is in the valve. If there is only a little narrowing, there may be no symptoms. Your doctor may use a procedure called a balloon angioplasty to stretch the valve so that it is more open. Your baby will be asleep during this procedure. The doctor puts a thin tube into a blood vessel. This may be a blood vessel in your baby's groin. Or it may be one of the vessels in the belly button. The tube is called a catheter. It contains a tiny uninflated balloon. The doctor moves the catheter through the blood vessel to the heart. The doctor feeds the balloon into the valve and then inflates it for a short time to stretch open the valve. Your baby may need open-heart surgery to repair or replace the valve. After surgery, your baby will need routine checkups to check his or her heart. He or she may need more surgeries or procedures in the future. Enter W687 in the search box to learn more about "Learning About Severe Aortic Valve Stenosis in Newborns".